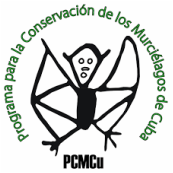 To Guarantee the protection and conservation of bats and their habitats in all of Cuba. To provide training and equipment to forestry workers and others interested in bat conservation in Cuba. To study the species richness and abundance of bats in caves, forests, and other roosts. To learn about the reproductive strategies of the various species, what they eat and other aspects. To Implement conservation actions involving park administrators in protected areas and the government and non-government entities for other areas where potential bat roosts may occur or where populations of bats are established. To declare important Sites and Areas of bat conservation (SICOM and AICOM), to the different regions that support bat conservation. This is a program run by RELCOM (Red Latinoamericana para la Conservacion de los Murcielagos) [Latin American Network for Bat Conservation]. To teach about the importance of protecting bats to primary, secondary schools, and university groups. To set up public photo exhibitions to allow the general public to learn more about the species of bats in Cuba, and their ecological importance. To promote the knowledge about bats through different mass media (radio, newspaper, television). To develop educational materials to promote education of bats in school programs. To run annual Bat Festivals to get the general public motivated and involved in bat conservation.